alaTest has collected and analyzed 175 reviews of Philips Hue White Ambience E14. The average rating for this product is 4.7/5, compared to an average rating of 4.7/5 for other products in the same category for all reviews. We analyzed user and expert ratings, product age and more factors. 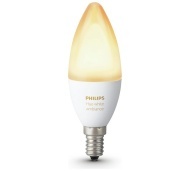 Compared to other products in the same category the Philips Hue White Ambience E14 is awarded an overall alaScore™ of 90/100 = Excellent quality. I love these bulbs. I have them all over the house. It is worth paying extra to get the coloured ones. Need a Phillips Hue Hub , then control on an app on you phones. Brilliant. I use this with my google home. Its very easy to set up and the price is standard everywhere so buy 3 pay for 2 was a great offer. Bought them to give a natural light to my wife's salon. The ability to use the preset scenes or to adjust the ambiance is simple in the app. Very simple to install. Whilst these are not the cheapest of bulbs they are quite simply gorgeous for creating mood lighting. Unobtrusive yet fully functional with a pick your own colour chart so you find the perfect colour for whatever you're doing! I have about 18 bulbs around my house and just love them all. They change the character of a room and are great fun. The quality of hue bulbs is amazing not going to back now!